“Catch me if you can!” You can see the fun and happiness in their faces. Full grown coyote family members tend to sleep and rest during the day, usually not all together as might be expected, but apart — and usually within the distance of a football field — from each other. They rendezvous after their day-long rest. The get together is the most exciting part of the day for them: it includes greetings with squealing, wiggles and hugs; playing all kinds of games such a chase, wrestling, play attacks, etc. ; there are confirmations of ranks, and there is mutual grooming, and finally they all head off trekking together further afield, which is when they hunt and mark their territories, and also explore and investigate. As pups mature and become more secure, they, too, will gradually join in this important daily event. But while pups are very young during their first several months, they stick close to “home” because it’s familiar and they feel safest here. Of course, the whole family plays together in this area: there’s chasing and wrestling, tumbling and bumbling, play attacking and jumping on each other, and lots of grooming from parents. But afterwards the adults of the family head off for more adult, rougher and farther-ranging fun, and the youngsters are tucked away in a safe spot, or sometimes not so safe spot, as I’ve discovered. So here are photos of a rendezvous: they are all blurry because they were taken as daylight faded (remember that photography is about light — the better the lighting, the better the photo), but I wanted to give you a glimpse into coyote life that you might not otherwise see. I’ve attempted to tease out some of the distinct elements/activities involved in the play and name them for you. These two coyotes are seasoned parents, having produced at least two previous litters, yet they themselves are so puppy-like in their all-out, exuberant and trusting play. The adoration between these two is particularly heart-warming among the coyotes I know — it melts my heart every time I see it. Their rendezvous seldom seems to include the greetings, grooming, or rank confirmations — it’s as though their bond is above needing these rituals — and concentrates almost exclusively on the play I show here. At their rendezvous, from their first eye-to-eye contact, you can actually see their *guard* let down as the happiness envelops them and they start running and jumping all over each other — it’s no different now than it was two years ago: they didn’t grow up out of this. What normally happens first is that they excitedly and joyfully race towards each other to be together. They engage in chase, catch-me, tease-shoving, tease leg biting: all joyful fun showing how bonded this pair is. This same scenario without the offspring, with variations in play methods and without quite this degree of affection, occurs in every family I know. Meantime, what about the pups who are supposed to be tucked away safely? The pups are three-months old and recently I found them not so safely tucked away, but out in the open, exploring on their own, while parents were having their own fun in an open field hundreds of yards away and totally absorbed in each other. These pups didn’t even see me until I had been watching for several minutes. The pups were close to some bushes which could provide an escape route from the dangers of dogs, raccoons, and even humans. They ran off after spending a few moment examining me from the distance, so their self-protective instincts are there, though not necessarily keen. I’m sure that if a quick dog had wanted to grab one of them, it could have. Dogs frequent the area. That parents devote this daily time strengthening and confirming their devotion to and affection for each other, over and above their “duties” as parents, is revealing of just how strong and important that bond is, and also attests to their amazing fun-loving natures. Know that concern for youngsters is indeed there: these are very responsible parents, and leaving them for periods of time is what all coyote parents do. A few days later, a piercing explosion nearby showed how quick these coyotes’ reactions were to possible danger to their pups. I surmised this explosion might have been a remainder firework from the 4th of July only a few days before. The sound provoked the immediate appearance and investigation by both parents who approached from different directions, one right after the other, close to the pup area. Obviously, neither parent had been with their pups when the noise sounded. This mother coyote tried remaining out of sight — I saw her keeping to the bushes — but she had to cross the path I was on, so, of course, eventually she knew that I saw her. She was very aware of me. After coming to the path, she trotted on over its crest, down an incline and remained out of my sight until I came to the crest of the hill. She continued trotting along this trail until she came to an intersection of paths. Here she stopped and looked back at me. Then she looked in other directions to assess the situation, and then she looked back at me again. I took her photo. She then squinted at me — she was communicating her needs to me. I stayed back, letting her know that I understood her message and would comply: I would not follow her. She then proceeded around the bend of the trail and out of sight. I did not follow, as she had requested, but climbed a ridge from which I could see her on the trail below. She had trotted on and then come to another standstill, looking back to see if I had followed. I knew from her behavior that, if I had followed, she would have lead me down this path which was away from where she had intended to go. Instead, since I was not behind her, she turned back about 100 feet and slithered into one of her secret hidden tunnels through the brush and, most likely, on to her pups, which we’ve heard but never seen. 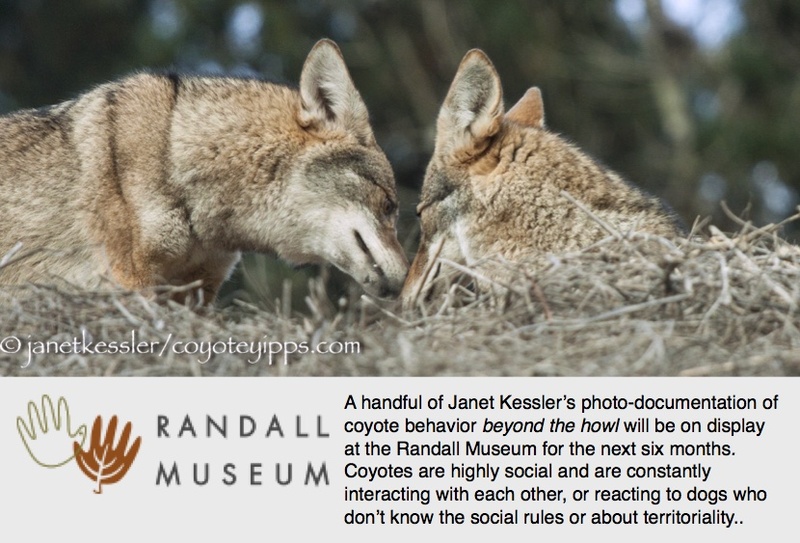 By respecting the coyotes’ needs, by actually listening and understanding their communications, we are achieving a mutually acceptable coexistence with these urban neighbors or ours.